On Saturday, 1 August 2015, during the busiest Amsterdam Gay Pride ever, there was an ‘empty’ boat amongst all the boats filled with dancing, partying people. But this doesn’t mean that no one was on board. On the contrary. This ‘empty’ boat actually had more people ‘on’ it than the other boats in the Boat Parade. 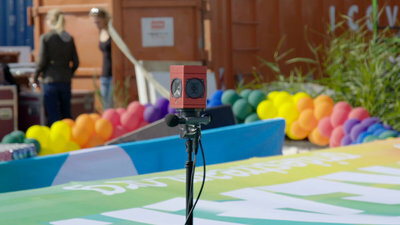 67,984 people from 128 countries all over the world, including many countries where homosexuality is still taboo, sailed on this boat as virtual passengers via the 360⁰ livestream on Pridestream.org. Thanks to this technology, using their smartphones, iPads or computers, they were able to see what it was like to be a passenger on one of these boats, complete with sound and video. Although freedom and acceptance are celebrated every year in the Netherlands during Amsterdam Gay Pride, this freedom is far from obvious for a great many people in other parts of the world. The Pridestream was specially developed by KPN and a group of driven creative agencies to enable all these people who were unable, forbidden or afraid to be there in person to experience what it is like to feel free to be yourself and love whomever you want. And even better, to know what it’s like to be cheered on by hundreds of thousands of people for doing so. The Pridestream boat was a special boat equipped with a 360° camera that sailed together with the other boats in the Canal Parade and produced sound and video recordings. 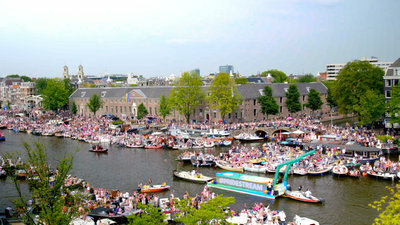 Via the secure website, pridestream.org, people from every corner of the world were able to experience the Canal Parade ‘live’ in digital form. Since viewers were able to decide what they saw during the stream, they could ‘look’ around as it were, using their devices, enhancing the feeling that they were really part of the celebration. The boat was equipped with huge LED screens which played videos of people from all over the world. The project was developed based on the drive to use creativity to make something possible that had previously been inconceivable. Even more important is that the Pridestream can make a social impact by spreading the freedom of Amsterdam Gay Pride all over the world; it also shows what KPN’s technology and connections can do for society. In addition to a unique partnership between the large group of agencies that bundled their technical and creative strengths, a collaborative effort was also created with the Amsterdam Gay Pride and the Workplace Pride organisations. Thanks to their LGBT support base, these organisations helped to promote the Pridestream to communities worldwide, and encourage people to ‘sail’ on the boat. On https://pridestream.org/ everybody can now relive the Canal Parade in 360° and experience what it was like to be on the Pridestream; you can sail the route of the boat and look around with your device, just like on the live stream during the event. - Homosexuality is still illegal in 77 of the 195 countries in the world? - This year marks the 20th edition of the Amsterdam Gay Pride, and therefore the 20th anniversary of the celebration of freedom of LGBTs in the Netherlands? - The 2015 edition of the Amsterdam Canal Pride was the busiest Canal Parade ever, with an estimated 300,000 to 650,000 visitors and 80 boats participating in the parade? - This was the first time that people all over the world could all simultaneously experience what it’s like to be part of the Amsterdam Canal Parade thanks to the Pridestream?